The din of last-minute construction echoed through the 100 thousand square foot building — creating an industrial soundtrack for pieces of fine art already hanging on the walls of the cavernous new art gallery called the Minnesota Street Project in San Francisco’s historic Dogpatch neighborhood. Even with the gallery’s opening just a day away, project co-founder Deborah Rappaport wandered about the space with the cool collective of someone who’s survived a remodel project or two. “I think people have realized the light at the end of the tunnel isn’t the train coming at them,” Rappaport said, surveying the building and its dozen new art galleries. Rappaport and her husband Andy Rappaport appear to be the engineers driving that art train — purchasing the former furniture repair warehouse in this up-and-coming industrial neighborhood and crafting it into a new light-filled home for 12 modern art galleries with below-market rents. The Rappaports, who describe themselves as successful entrepreneurs-slash-art collectors — said the idea was to combine their passions to come-up with a partial solution for the city’s increasingly priced-out art scene. The giving back hasn’t stopped with the vast public gallery which opened with fanfare last Friday — lines for the opening reception and weekend activities stretched down the block. 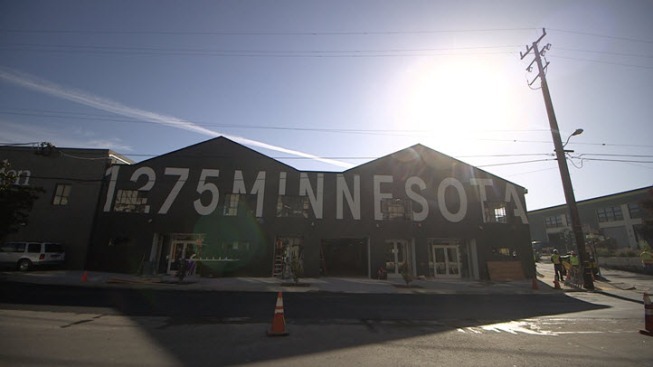 The Rappaports also purchased an old warehouse across the street and are in the midst of turning it into artist studios — with room for several dozen artists, also at below market rents. Wagner said she would likely move to the new studio space since the Mission District building where her current studio is located is likely to be sold soon. She said she is constantly reminded of the financial squeeze that has forced working artists out of the city and even out of the Bay Area altogether. It’s not just the artists who have felt the pinch. Art galleries, especially those located in the traditional art corridors around Union Square have also suffered sticker shock when renewing leases. Ed Gilbert who’s run the Anglim-Gilbert Gallery in Union Square for decades decided to open a second location in the Minnesota Street Project building. The Rappaport’s plans for the project also include a restaurant headed by Daniel Patterson that will open in the Fall and a storage facility for galleries to store their art. But Rappaport cautions the burgeoning arts center is not a fix-all for the city’s struggling arts scene. She said she is hoping other people with a head for business and an eye for art will open similar spaces in the area. She predicts her business will become self-sustaining in a short time — providing others with the incentive and a business model to follow.